President Obama told reporters today that he’s committed to a six-year plan to rebuild 150,000 miles of roads, lay and maintain 4,000 miles of railways, restore 150 miles of runways, and create a national infrastructure bank. 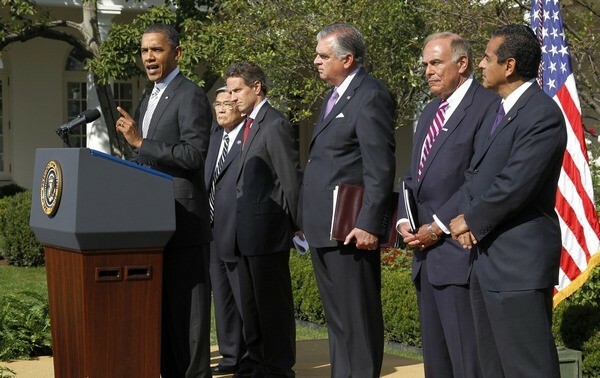 He made his remarks after meeting with Transportation Secretary Ray LaHood, former Secretaries Samuel Skinner and Norman Mineta, L.A. Mayor Antonio Villaraigosa, Pennsylvania Governor Ed Rendell, and Treasury Secretary Tim Geithner. They all stood beside him as he spoke to the press. The president’s remarks echo the promises he made on Labor Day, when he announced a $50 billion “down payment” on transportation and infrastructure spending. LaHood later told activists that the administration planned to get behind a six-year plan in February. He also referred to a new report by the Department of the Treasury with the Council of Economic Advisers on the economic impact of infrastructure investment [PDF], emphasizing the significant return from projects that are rigorously analyzed and selected “rationally.” Noting that the average American family spends one-third more on transportation than on food, the report bolsters the administration’s strategy of investing in projects that give middle-class Americans options besides driving. Obama’s comments — and those of the Democrats and Republicans who flanked him — underlined the traditional bipartisan support for infrastructure spending. With the elections looming, there hasn’t been bipartisan support for anything in Washington lately. They’re hoping that will change. With that one line, evoking the needless deaths in New Orleans and Minneapolis, he practically dared Republicans to oppose this plan on the basis that it involves too much spending. The administration’s long-awaited transportation push is finally underway. We’ll have more analysis in the days ahead. Thanks for the report, Tanya, but can we get something about what this means for transit, and for livable streets? How will it affect mode share? 4,000 miles of railway? So one cross-country track? The whole interstate highway system is only 46,000 miles. If we build 4000 miles every 6 years, the interstate rail system could rival the road system in my lifetime. And there are many redundant or lightly-used Interstate highways, such as urban bipasses and rural interstates, which will probably never need a rail equivalent. Consider also that the entire California High Speed rail plan is less than 800 miles. We could build that whole system, including the second and third phases to Sacramento and San Diego, plus the Florida system, plus several corridors to Chicago and in the North-East Corridor. The entire New York MTA subway system is only 842 miles of track, including yards and non-revenue track. The real key is that his plan only guarantees to “rebuild” 150k miles of roads, and does not promise any particular new road construction. I’m sure the States will continue to build rural and suburban highways, but it looks like the Administration is focusing on maintenance for roads and runways, while also aiming for expansion of rail service. Oh Antonio, if this happens and you successfully get construction started on the Regional Connector and Purple Line before your term is over, I hope a Metro station is named after you! Joseph M.: Thanks for the insightful response. This seems like a perfect time to make a push honestly. This is something that is primed for a lame duck session. I mean it is something that needs to get done that is not so partisan that maybe could be passed during the lame duck? What are your guys thoughts? Is this plausible? Well, a progressive transportation bill would be an uphill push under the best of circumstances, and these ain’t the best of circumstances. Let’s wish him luck. What’s conspicuous is how thin the behind-the-president lineup has gotten. He’s even had to buttonhook Geithner (!) to stand up for him. It must be lonely these days at the White House.